Police are investigating claims that a teenage British tennis player was poisoned at Wimbledon last month. 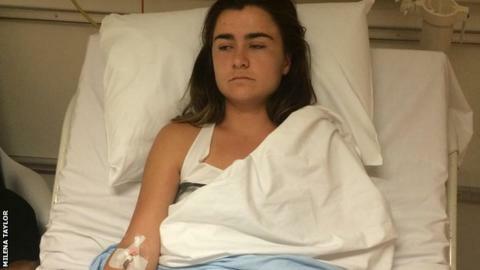 Gabriella Taylor, 18, spent four days in intensive care after becoming unwell during her girls' quarter-final match. Scotland Yard says it has received an allegation of poisoning with intent to endanger life or cause grievous bodily harm. Taylor's mother, Milena Taylor, told BBC Sport her daughter was "still not 100%". She said that doctors diagnosed a rare strain of leptospirosis - also known as Weil's disease - a bacteria which can be transmitted through rat urine. The teenager, from Southampton, had been staying "in a completely healthy environment" and it was "impossible" for her to have simply become ill, her mother added. Mrs Taylor also said the LTA were fully behind the police investigation and chief executive Michael Downey had personally "expressed his sympathy". "It will take quite a long time for Gabi to recover completely, especially mentally," Mrs Taylor told BBC Radio Solent. "It's been very scary as she was in a quite severe state and if you read up on the condition, it gives you lots of mortality cases. "We came back to Spain this week to start training again, to get her back into physical shape. But it will be a long process." The junior player last week spoke to BBC Sport about the mystery illness she contracted during the tournament, saying: "It was such an awful experience, probably the worst time of my life." Taylor, ranked 381 in the world, did not pick up a racquet for a month after being forced to stop against Kayla Day of the United States on 7 July. She returned to training this week. "It started the day before as a stomach bug and I managed to overcome it by winning my match that day," Taylor added. "But, the day of the quarter-final, I woke up and felt 10 times worse. I couldn't believe it was happening to me in one of the most important tournaments of my life." A police statement said the allegation was received by officers on 5 August, concerning a possible offence at an address in Wimbledon between 1 and 10 July. "It is unknown where or when the poison was ingested," a spokesman added. A Wimbledon spokesman said they had not been approached about the investigation by the police, adding: "There is no record of Miss Taylor using her catering pass to eat on site at the championships in 2016."